Our selection of sinks and faucets ranges from industrial to elegant, with styles that are attractive without sacrificing functionality, durability, and longevity. Because of our dedication to quality and our commitment to our customers, we inspect every faucet and sink multiple times before they can earn a place in your installation. 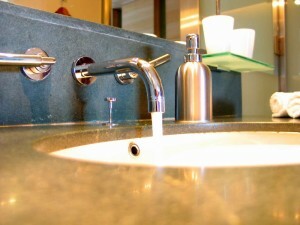 At Holbrook Granite and Marble, we assist you with proper sink selection, so that your sink, whether drop in or under mount, will be sanitary and safe. We can also assist you with measurements to make sure that your sink will fit in the cabinet in which it is to be mounted and that there is enough room available for the faucet and any other accessories. Contact us today to discuss your new kitchen or bath.